Make sure that Use Cellular Data is toggled off. Now that Apple has officially released iOS 7 into the wild (find out how to upgrade here), we’re about to see all of our favorite smartphone apps release updates to take advantage of its new features. But before you go updating, be warned: Apple has doubled the size limit on over-the-air app downloads to 100MB. Previously, Apple limited the size of App Store data transfers over cellular networks to 50MB; anything larger than that required a WiFi connection. It’s a common-sense limitation – many of us have very limited 1 or 2GB data plans. A handful of app downloads and updates can chew through that small allowance in minutes. It’s clear why Apple raised the download limit. Apps continue to get larger and larger as iPhones get more powerful and run more complex apps. Unfortunately, that means it’s easier than ever to accidentally go over your data allowance, especially now that iOS 7 allows for automatic app updates. To make sure that a couple frequently updated apps don’t force you over your data allowance, I recommend you disable automatic over-the-air updates when you don’t have an active WiFi connection. 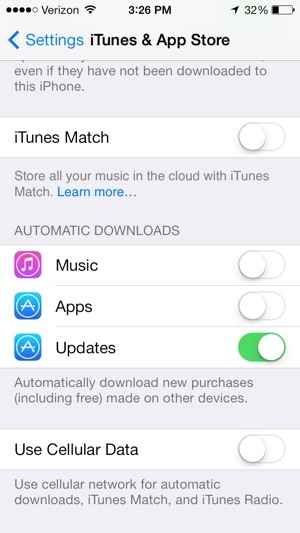 You can do this by tapping Settings, then choosing iTunes & App Store. Scroll all the way down to the bottom of the page and make sure Use Cellular Data is toggled off. I was frustrated with outrages prices for data plans and my former phone company charging me overage fees. I found Solavei, which runs on a 4G network and gives me unlimited talk, text AND data for only $49 a month, no contract!! PLUS every three friends that join pays me $20! I’m working towards getting it free! These updates are getting bigger and bigger and there is no reason to pay more for extra data plans! I’ve had the service for 9 months now without a single problem! Works with GSM phones! Try it! Good news for those of us still hanging on to our old unlimited plans.